Disclosure: I was recently invited to visit Hershey Pennsylvania by Hershey Entertainment and Resorts. Accommodations and schedule of activities were provided by HE&R. All opinions are my own. 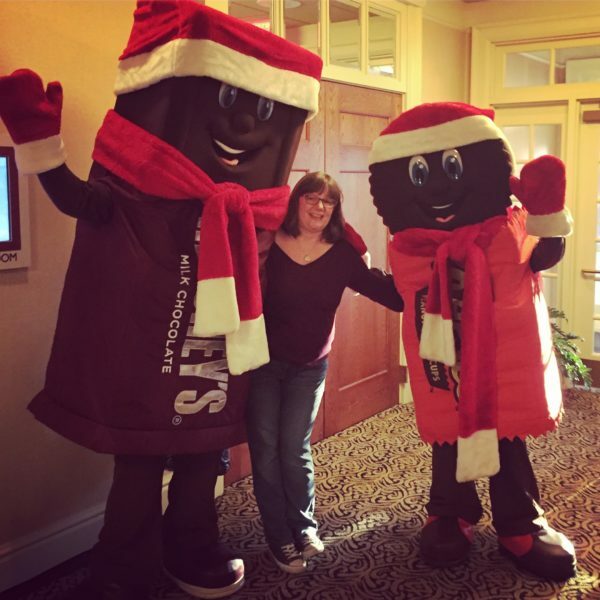 I was so excited to be invited to attend the Sweet Welcome Weekend in Hershey, Pennsylvania. Even though we're only about 2 1/2 hours away from Hershey, I've never visited. I'm a huge fan of all things Hershey (YUM) but I really had no idea what to expect outside of Hershey Park... and chocolate beyond my wildest dreams. If I needed to give my review of Hershey, PA in one sentence I would have to say: I was simply blown away by how much there is to do in Hershey beyond Hershey Park. I really had no idea (and I'll share more in 2 more posts about Hershey!). 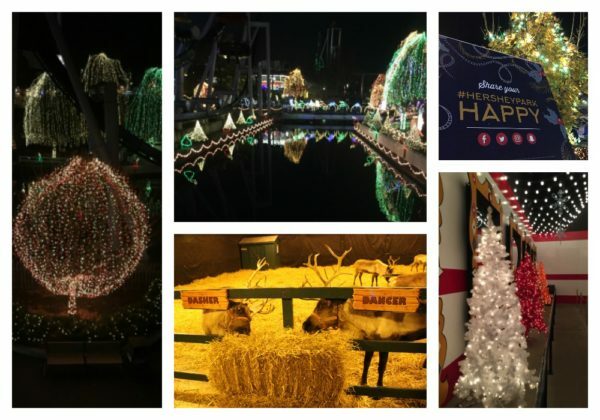 Hershey during the winter Holiday Season is simply magical. We had an unusually warm November weekend for our visit... but it was otherwise a Winter wonderland full of sparkles and sweets. I fell in love with how festive absolutely everything was. How could I not? I LOVE chocolate... and I LOVE Christmas decorations! And finally... the high light of holiday lights in Hershey? The Hershey Sweet Lights Holiday Drive-thru Spectacular. Amazing. Pictures cannot do it justice. After taking a few blurry shots I gave up and put the phone and camera away. With over 600 illuminated displays, through over 2 miles of wooded trails to drive through... you just have to sit back in awe. We spent the entire time exclaiming and pointing "Look reindeer! Look elves! Look at the angels! Look 12 maids a milking!" Keep in mind we were a group of adult bloggers! I can only imagine how much more magical it would be with the kids in the car. (It's open nightly until January 1st.) Even Hershey's Sweet Lights video doesn't show the entire display through the woods! I'm telling you...easily one of the most impressive light displays I've ever seen.
. It's just an entire month of holiday cheer! Oh... and don't forget the hot cocoa! (Because oh. my. goodness. the Hershey Hot Cocoa is to die for!) On our last day they treated us to a special Cocoa Bar. Hershey's Cocoa doesn't need ANYTHING added to make it delicious... but some marshmallows and vanilla and chocolate whipped cream... oh my. If you're looking for a little getaway before the year is over... think about visiting Hershey, PA! Maybe for an adults only getaway?